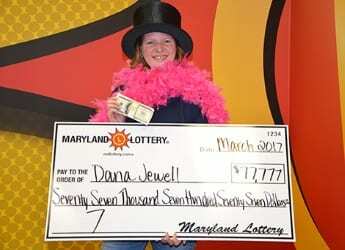 Dana Jewell of Parkville found a gem of a Maryland Lottery win hidden in a Lucky 7 scratch-off. She uncovered the $5 game’s $77,777 top prize. Lottery luck stopped in at the 47-year-old’s employer, City Line Bar and Grill on Belair Road, while she was working. After her shift ended, the popular bartender decided to purchase a few of the shiny new 7 instant tickets that her business was selling. Dana told Lottery officials that she almost didn’t win. The Baltimore County resident decided to let another person go in front of her to buy games and that customer purchased a few of the 7 scratch-offs first. She scratched off her games while relaxing at the bar. The first ticket wasn’t a winner. To Dana’s surprise, the ticket scanner told her to head to Lottery headquarters to claim a $77,777 prize. The lucky winner also plans to make some investments and save whatever she has left after making her purchases.